Join us in Cardiff for our first event of 2019. On the evening of 12 April, we’ll be holding our first ASone social evening – a chance to join other local people with an interest in axial SpA (AS) and meet with the team from NASS at an informal gathering. Make new friends, ask NASS those burning questions and enjoy your first drink on us! 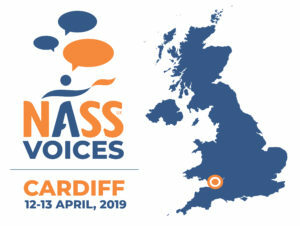 On Saturday 13 April we move on to our Cardiff NASS Voices event, featuring informative talks and discussions by rheumatologists, physiotherapists and members of the NASS team. Take away tips from the experts, learn self-management techniques from your peers, find out more about the latest research, and leave better equipped and informed than you were when you arrived! We look forward to welcoming everyone with an interest in axial SpA (AS) – you need not be a NASS member to attend. No young children please, as this is a learning event. Please click here to view the full agenda and register using the form below. Find the event poster here, to print, to share with your local clinic and hospital, or to pass on to a friend! There is no fee to attend the ASone social on Friday 12 April and you don’t need to register. If you wish to attend the NASS Voices event on Saturday 13 April there is a cost of £10 per person which includes coffee/tea breaks and lunch. To complete your booking please fill in the form below and click submit. You will be redirected to then make your payment via the NASS website shop. Entering your address is optional but it will help us to map areas of the country where our support is most needed. Please list delegate name alongside any special requirements. Do you have any general questions you'd like to ask a rheumatologist? Do you have any general questions you'd like to ask a physiotherapist? Do you have axial spondyloarthritis, including ankylosing spondylitis (AS)? How long have you had a diagnosis of axial spondyloarthritis, including ankylosing spondylitis (AS)? How long did you wait from the first onset of symptoms until you received a diagnosis of axial spondyloarthritis, including ankylosing spondylitis (AS)?